Pose the following to data-revolution-for-development activists: “Show me an initiative of yours that has led to scaled, sustained development outcomes”. If – as likely – they struggle, there’s a simple reason. We have not yet connected the data revolution to a praxis revolution for development. The data revolution takes advantage of technical changes to deliver new volume, speed, and variety of data. The praxis revolution makes changes to development processes and structures in order to turn that data into development outcomes. Perhaps data activists never took, or fell asleep during, Information Systems 101. Because the very first session of that course teaches you the information value chain. You’ll find variants of the example below in Chapter 1 of most information systems textbooks. It explains that data per se is worthless. Value – and development results – only derive from information used in decisions that are implemented as actions. To make that happen you also need the intelligence to process the data into information; the imperative that motivates you to run the whole chain through; and the soft capabilities and hard resources to access data and take action. – new institutional values and incentives that orient towards these new decision-making modes. At present, that does not seem to be happening. If we create a quasi-heatmap of the focus for some key data-revolution-for-development (DReD) sources, then we see that almost all the focus lies at the source of the value chain or before (prioritisation, digitisation, standardisation, etc of data). There is a very little thought given to the development impact of data. And the “wings” of intelligence and imperative, and the core of praxis (information-decision-action) are missing. Of course that’s partly understandable: there’s a clue in the term data revolution; in the remit set for organisations like Global Pulse; and in the technical profiles of most of those involved. And the limited incursion of techies into praxis is partly welcome. As Evgeny Morozov has noted, the techie prescription for praxis is algorithimic regulation – a steady incursion of automation into the downstream stages of the value chain which assumes digital decisions and actions are some apolitical and rational optimum, which denies the importance of politics and thus neuters political debate, and which diverts attention from the causes of society’s ills to their effects with the attitude: “there’s an app for that”. So, at present, we face two future problematic streams. One in which a great deal of money is wasted on DReD initiatives that make no impact. One in which a technocentric view of praxis prevails. Both require the same solution. 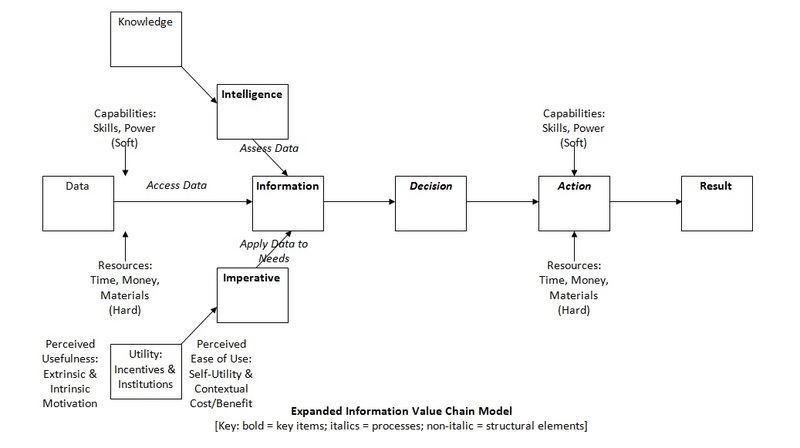 First, an explicit recognition of information value chains in the design and implementation of all DReD projects. Second, a more multidisciplinary approach to these initiatives which incorporates participants capable of both debating and delivering the praxis revolution: those with information systems, organisation development and political economy skills are probably more relevant than decision scientists – to paraphrase Morozov, we’ve got quite enough Kahnemans and could do with a few more Machiavellis. Developed from Heeks & Kanashiro (2009) with a modification courtesy of Omar Malik, University of Nottingham, UK. Analysis of the content of: http://devinit.org/wp-content/uploads/2013/09/Data-Revolution-DI-briefing.pdf; http://www.opendataresearch.org/content/2014/667/researching-emerging-impacts-open-data-oddc-conceptual-framework; and http://www.unglobalpulse.org/research/projects. A fuller and more robust analysis will require more sources and co-coding of content.